Fill in all required info: Name on card, card number, expiration month and year, CVV, and billing zip code. You can also pay using Apple Pay on a compatible Mac computer, iPhone, or iPad. The invoice itself may also contain the merchant’s email and phone number at the bottom of the page. 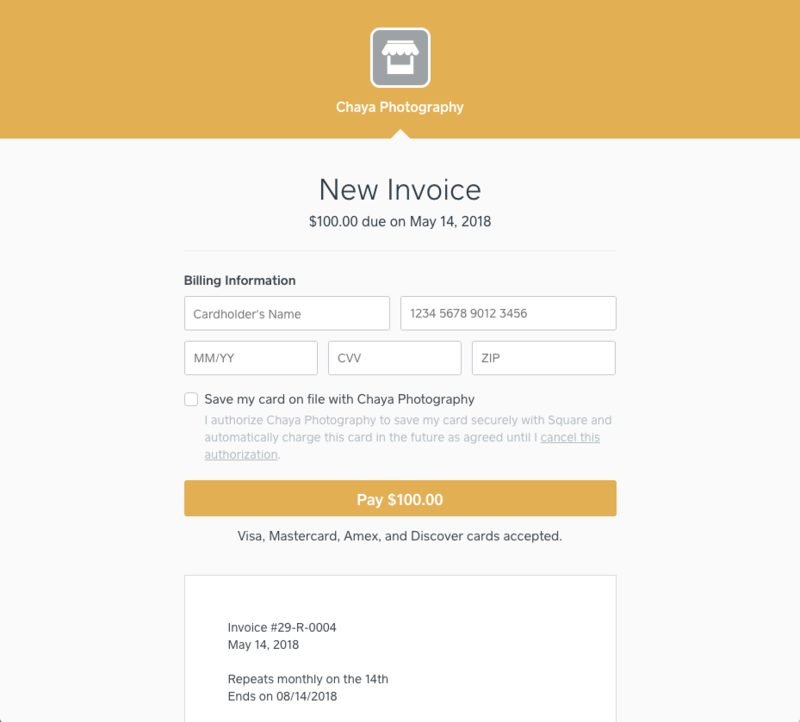 When paying an invoice sent by a Square merchant, you can save your credit or debit card information to make paying invoices from that business faster. There is no charge to you for paying a Square Invoice or saving your card on file and can remove your payment card information at any time. Click Pay Invoice in the invoice notification email. Check the box authorizing the business to store and charge this card for future purchases. Visit the last invoice you received from the Square merchant. At the bottom of the email, follow the link to your Card Dashboard. Once in your Card Dashboard, click Remove next to the card details and select a reason for the removal. Square’s approach to security is designed to protect you with industry-leading standards for fraud protection. We keep your information safe and notify you anytime your saved payment card is charged so you can review your purchases, revoke authorization if you choose, and be on the lookout for unauthorized transactions. Learn more about Square’s security practices. When you first approve a merchant to save your card information, you will be required to provide your email address and your card’s billing ZIP code. Your email address will be used to notify you when your card is stored, if your email address is changed, when a payment is made using your stored payment card, and for marketing or other messages from this merchant.